Today you're getting a two-fer. Why? Because these two have never been mailed and have boring, blank backsides. 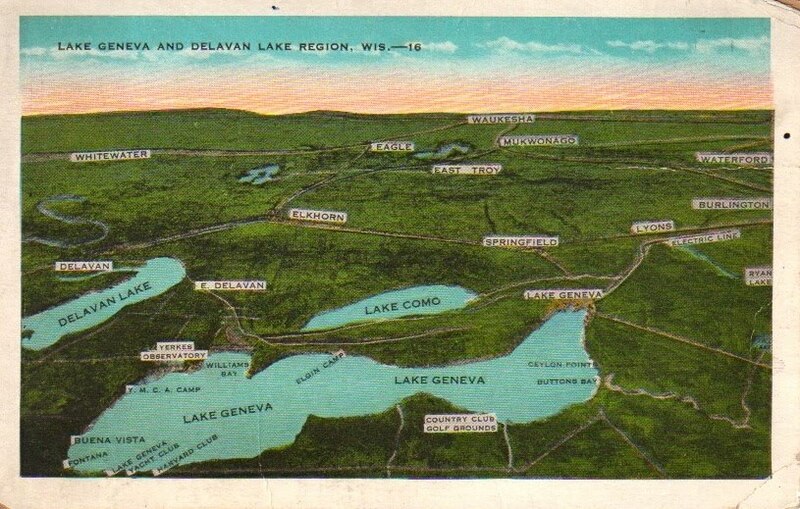 Both are from Wisconsin's second deepest natural lake, Lake Geneva. Sitting just across the border from Illinois in South Eastern, WI, the Lake Geneva area has been the "Newport of the West" for generations, with many Chicago business leaders calling this lapis jewel home during the summer months. Families such as Wrigley, Sears, Swift, Harris, Pinkerton and Schwinn all have or once had mansions on its shores. Plenty of summer camps also existed on the shores of Lake Geneva, including Olivet Camp as featured below. I've spent many days playing on or around Lake Geneva, but I don't know the lake's natural and man-made features as well as I know those on Green Lake. However, I'm pretty sure this camp was on the north shore, towards the western edge of the lake. I like the canoe and other boats pictured, along with the oh-so-modest bathing suits. A few camps are identified on the next Lake Geneva postcard, but not the Olivet Camp. 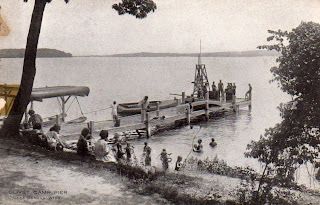 My great grandparents had a place near the Harvard Club in the southwest part of the lake. My Great Grandpa Finer built a stout field stone cottage a few hundred feet from the shore, a great place for my dad to experience growing up, spending summers sailing and swimming. The home still stands, I'll have to get my mom to send me a couple of shots of the place.